When you have a limited space, yet you need to accommodate more people, then bunk beds could be of a great use, as they are used for this very purpose where there is a lack of space. Hence, it could play a vital role in such tight spaces. You could be throwing a party or there may be guests arriving at your place to stay for somedays, if you have bunk beds, you need not worry at all even if you have a small compartment. There are many pros and cons of having a bunk bed. It will depend upon the frame of reference via which you look upon at it. For example, bunk bed with desk not only serves as the bed to accommodate multiple people but it also gives other benefits such as storage, studying, etc. Hence, while opting for a bunk bed, you need to look for your needs and buy the bunk bed accordingly. Since there is a limited space available in the room, having a bunk bed with desk will greatly reduce the space problem. 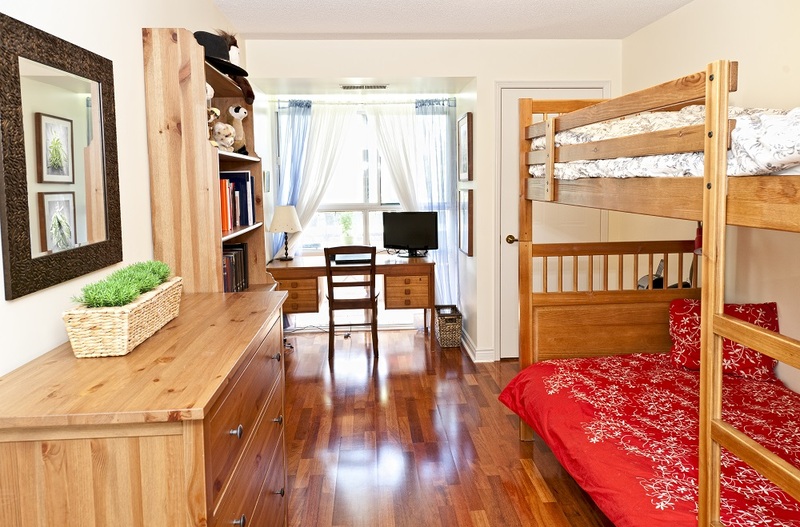 Your kid will now be able to sleep on the top bunk while the desk will occupy the low bunk where he/she can study. On the other hand, the bunk beds are also useful in other aspects such as, when you have a bunk bed with desk, you can use the storage container as a cupboard and put the toys, clothes, or shoes of your kid there. Hence, even if you will not have many places to put all those things in the traditional manner, with the help of the bunk bed with desk, now you can keep the room neat and clean. The bunk bed also provide privacy to a certain extent. In certain circumstances, it is inevitable that you will need to share the room with someone else. In this case, there will be pretty much no privacy between you and your roommate. But in the case of bunk beds, there will be a certain level of privacy between each level. You can use curtains for your own private space and can make it even more private than it was before. Hence, it not only helps in organizing the room but with bunk bed with desk, it also gives privacy. At a certain point in time, there will be a time when you will need to stay at the dorm where bunk beds are common in different areas. In these cases, sharing a bunk bed in earlier stages of life gives you the opportunity to get accustomed with the environment of sharing the room so that you will not have a problem in adjusting later in your life. When kids are sleeping at the top bunks, there will always be a safety issue involved. Hence, one should make sure that the guardrail is always of appropriate height when kids are sleeping in the top bunk. Bunk bed with desk may not be suitable for all people, as may find it hard to get accustomed due to different difficulties. Some may find height as the issue and some other may find their body may not go through all the hassle of climbing up. In a nutshell, you can opt to choose the bunk bed with desk to make the proper utilization on the tight space and even make the best use of storage as well as fulfil the study purpose at the same time.